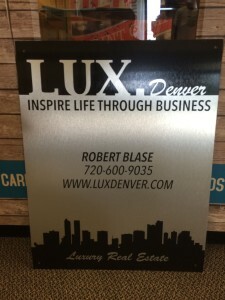 Denver Print Company is proud to offer businesses cost effective aluminum sign solutions in Denver. Choose from a variety of thicknesses and print finishes, full color, single color and spot color prints. All of our aluminum signs are printed and laminated in house to give you the best possible price and the fastest possible turnaround in Denver. Aluminum signs have many applications and can be used indoors or outdoors. There are multiple ways to hang and display your custom signs. If the job requires installation, our professional team will gladly assist you. Aluminum signs make great real estate signs, store front signs, yard signs, parking signs, traffic signs and display signs. Pre-cut shapes save you time and money and the internal design team at Denver print Company has designed hundreds of signs that fit these pre-cut aluminum shape signs. Need a custom shape, rounded corners or custom mounting holes drilled? Our team can manufacture any shape, thickness of sign that your project requires. Custom signs require a little more time and precision but our team is more than capable of having this work done in house. We know how important it is to have your printed materials ready for that last minute networking meeting. Denver Print Company has established its self as the go-to rush printer in Denver. What is a setup fee? Denver Print Company prides itself on producing perfect prints every single order. We insure every file is properly set-up for print by having a professional graphic designer review every single file. This little step goes a very long way. All wide format orders require a $45 minimum. Have your sign professionally designed by the experts at Denver Print Company. We have helped real estate agents create the eye catching sign that gets homes sold. We have created signs that help guide customers to make buying decisions and take directions, our signs have been seen all around the Denver metro area directing traffic and letting people know where to park. Sign making is a work of art and our trained professionals are available to develop your next successful sign. With over 15 years of sign design experience our team has developed hundreds of signs that can been seen all around Denver and the surrounding cities, we pride ourselves on creating amazing looking signs that stand the test of time. If your office is lacking that wow factor maybe a custom aluminum sign is what is needed. Aluminum signs are a great way to improve the look and add style to your lobby or conference room in a way that no other sign could. Add back lite or a custom wall graphic behind the sign and add a whole new level of professionalism to the room. Our Lobby signs are made from a huge variety of materials, such as aluminum, brass, bronze, copper, chrome, stainless steel, stone and laminates with all types of finishes. The expert project managers at Denver Print Company would be happy to schedule an onsite inspection today. Aluminum is often used in the creation of outdoor signs and more specifically inside monument signs. Our monument signs are made of the highest quality aluminum material and with combined with our superior full color UV printing give you a sign that will look great and last for years to come. Monument signs are not associated with “cheap Signs” but when aspects of the sign take advantage of the cost savings found with aluminum signs you can drive the initial cost down quite a bit.